In 1919, Leo Marchutz sold his first painting. He was 16 years old. 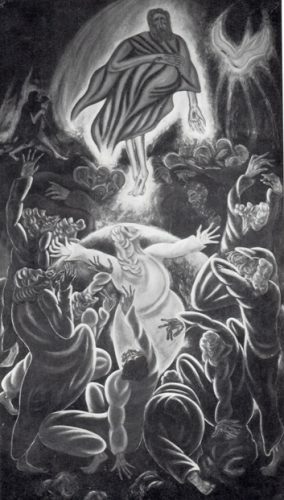 The Ascension (oil on canvas, 100 x 177 cm.) was purchased by renowned Austro-American theater and film director, Max Reinhardt. This first sale, and the letter1 of encouragement sent by Reinhardt to the young painter, played a decisive role in the destiny of Leo Marchutz. February 2019, a century later, the painting that launched Marchutz’s career, was the first work recorded on the digital platform2 of The Leo Marchutz Catalogue Raisonné. — Correspondence between Leo Marchutz and Karl Ernst Osthaus, patron of the arts and founder of the Folkwang Museum in Hagen Germany, regarding the Marchutz exhibition organized there by Osthaus in 1921. — Published references, on Leo Marchutz’s work by eminent art critics of the time, along with Max Reinhardt’s letter to Marchutz. Work on the cloud-based catalogue raisonné platform began mid-February, with particular focus on Marchutz’s early paintings (1919-1939). Consisting of assembling and comparing existing information, entering data, following up on new and old leads in museums around the world… the process promises to be long and fascinating. Three weeks into the project, 40 of Marchutz’s paintings have been recorded – along with The Ascension – works from both his German period and his early works in Aix. A preview of a selection of paintings from Marchutz’s early period will be forthcoming, as will a “Call for Submissions” requesting information from those who may own or be familiar with the early paintings of Leo Marchutz (1919 to 1939). "It is our hope that answers to queries addressed to various museums in Germany will shed more light on works, such as The Ascension, whose whereabouts remain unknown today." 1Reinhardt 1919: Reinhardt, Max. “Letter to Leo Marchutz.” In Leo & I and the Ghost of Cézanne: A Memory of Art and Provence, William M. Weyman. North Charleston, SC: CreateSpace Independent Publishing Platform, 2013, p. 7. 2 The platform and digital cataloguing tools used by the Marchutz Catalogue Raisonné were designed by panOpticon, a New York-based company specializing in data management systems tailored to catalogue raisonné specifications. panOpticon powers the catalogue raisonnés of of over 50 artists, including Paul Cézanne, Mary Cassatt, Roy Lichtenstein, Sam Francis, and John Singer Sargent.